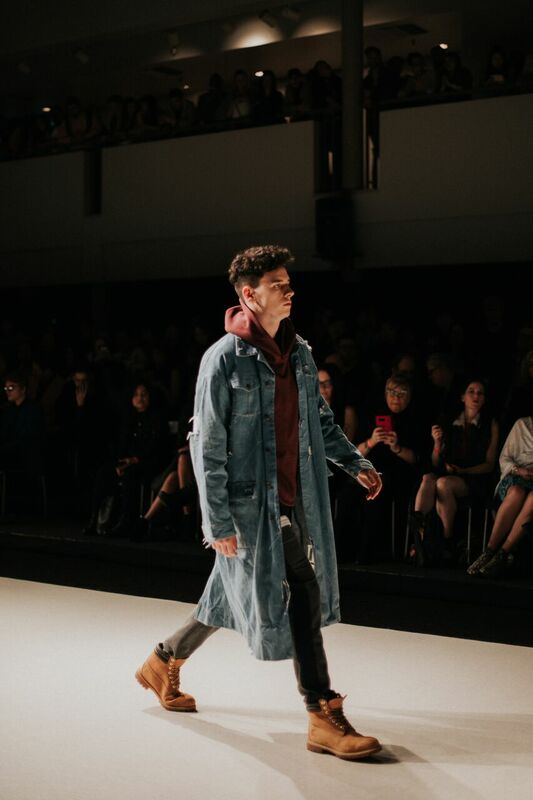 This past March, I had the opportunity to attend Vancouver Fashion Week for their fall/winter 2018 showcase. It was such a great experience seeing all of the new and amazing up-and-coming talent. Of course, there’s always certain collections that really stand out! In this case, it was definitely the menswear line, “Not ForYou” by designer, Jerome Taylor. Jerome is originally from Wellington, New Zealand where he went from roofing to runway! 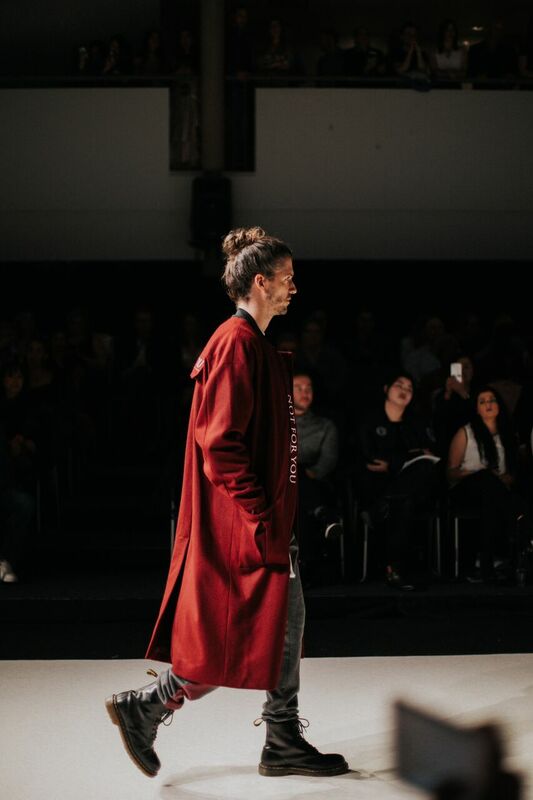 He has now shown his line for two seasons of New Zealand Fashion Week, so it was definitely a privilege to experience his work here in Canada. 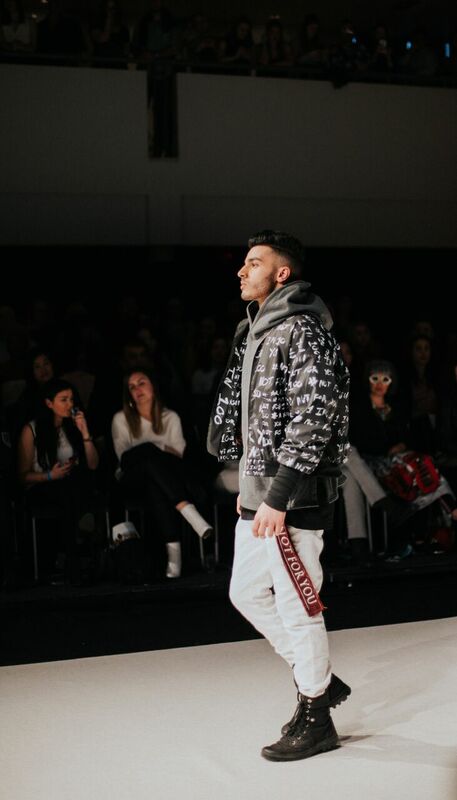 I was instantly in love with his collection, as it was so clearly evoking a unique vision; transforming art and passion into the fashionable streetwear. 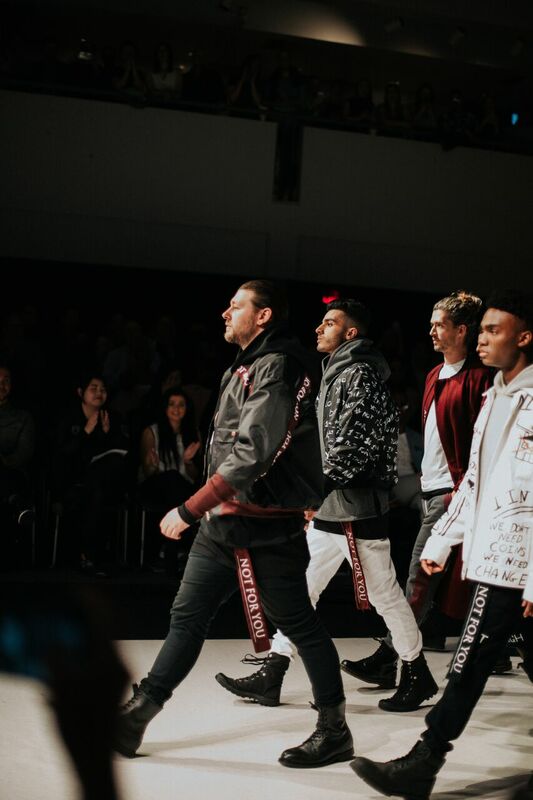 The N.F.U line is inspired by “art, music, love, heartache and current events…”, and specifically towards the homeless of New Zealand, which was a clear statement in his latest showcases at NZFW and VFW. Although, it’s not just me who has taken a liking to this label. Jerome has caught the attention of numerous top media platformssuch as fashiontv.nz ,tvnz.co.nz and vice.com. His work has even been sported by TV icon, Miss J Alexander (Americas Next Top Model) at this years VFW. …a definite step in the right direction towards his goal of being “the top menswear designer”! What inspired you to choose Fashion Design as a career? I didn’t necessarily choose fashion design as a career, I had a love of art such as graffiti from a young age and from my art work I found fashion and it grew from there. I feel like fashion is a form of artwork so I get the best of both worlds when I design. When did you realize your passion for the Fashion Industry? I feel like my passion is not with the fashion industry but more in the ‘art’ I get to create. I love being apart of the industry as it allows me to share my thoughts and feelings with the world through the garments I create. I also love that my garments will be worn by multiple people and seen by more people versus artwork being stationery and only visible from one place I have found something I love that allows me to utilize my skills and allows me a creative outlet. I create collections based on my own thoughts and feelings, I wanted to bring attention to something that a lot of people try to hide or run from. My thoughts and feelings on homelessness were so biased to my own opinions before I created the collection however now I have a whole new perception and I wanted to share the knowledge I learnt with everyone. I did this through visual imagery and layering. Explain who your goal target market is? My target market is males and anyone who wants to feel empowered and strong when they wear Not For You. My garments demand attention and it allows the wearer to feel the best version of themselves. Do you see yourself focusing mainly on menswear or will you expand into womenswear? I create menswear collections as I am a male and it’s what I like and what I would wear however, we have had so much interest from females which I think is awesome that we’re reaching a wider audience. I want to create menswear and do it to the best of my ability however, in the future I would love to take on the challenge of creating a women’s wear collection. What is your fashion forecast? In what direction do you see your designs going? I want the overall aesthetic to remain the same however as I design collections based on my own thoughts and feelings my direction is to always evolve and always use this platform I have been given to it’s full potential. What is your absolute favourite piece you’ve designed and why? My favourite piece is my double breasted jacket as it is one of the most challenging garments I have had to make. I had to learn alot about tailoring and different types of pattern making to ensure I made a quality garment. Who are your favourite designers and how do they inspire you? My favourite designer is Jerrry Lorenzo I am also heavily inspired by street style and artists such as Kid Cudi, Kanye West and actor Shia Labeouf. I also love the authenticity of Tokyo street fashion. What are some staple items you cannot travel without? Bomber Jacket, Black Jeans, Boots and my headphones. If you could design the wardrobe for any TV show or movie what would you choose and why? I don’t watch a lot of TV or movies however I would love to dress Kanye West for one of his music videos, his style is amazing and I would love to create for him. How do you stay motivated as a designer? I love to create and when I am not creating I am totally unmotivated so I always aim so high that I never have a dull moment. I also like to run which allows me to think freely. Is there a certain motto or advice you live by? What can we look forward to seeing in the future from “NOT FOR YOU” Clothing? Bigger and better, I want to be the top menswear designer and internationally recognized!